May I Plug in My Electric Car, Please? One of the best features of driving a plugin electric car is that you don’t have to go to the gas station to fuel your car. Instead you can fuel your car at home. But plugging in away from home can be a little tricky and may need some extra explaining. I have driven a 2011 Chevy Volt range extended electric car for the past 3 years. I love my Volt. After decades of owning BMWs, the Volt is the best car I’ve ever had the pleasure to drive. It’s also possibly the most misunderstood car. The Chevy Volt is a unique plugin serial hybrid electric vehicle. “Yeah, what’s that?” you may ask. Let me explain. The Volt’s advanced lithium-ion battery first allows you to drive gas-free for about 40 miles. Then the onboard gas-powered generator provides electricity so you can drive a total of 380 miles on a full charge and a full tank of gas. But, if you routinely recharge your Volt before the battery runs out, you can drive the Chevy Volt forever without using gasoline. That’s right. As long as you keep its 16 kWh battery charged, the gasoline range extending generator won’t need to come on and use gas. So the Chevy Volt is both, at best, a 100% electric car or at worst, a high-mileage 40 MPG gas car. You can choose. If you drive 40 miles or less a day (as most Americans do) one charge per day will do. If you drive 80 miles a day, you can charge it twice and avoid using gasoline. When it’s parked, just plug it in and top it off. The Volt is an electric car that you can use with no trade-offs. You can drive it with or without plugging it in. But once you get a Volt, plugging in becomes an addictively fun game. Most plugin car owners charge their cars at home for most of their miles. I drive 98% of my miles on cheap electricity from my home. But there will be times when you might want to take advantage of an opportunity to charge “in the wild” to avoid using gas, especially when you are visiting relatives or friends on longer trips. “May I plug in my car, please?” can be an uncomfortable request for those unfamiliar with EVs. They have no idea how much electricity your car will use and most people have no idea even how much they pay for their electricity. 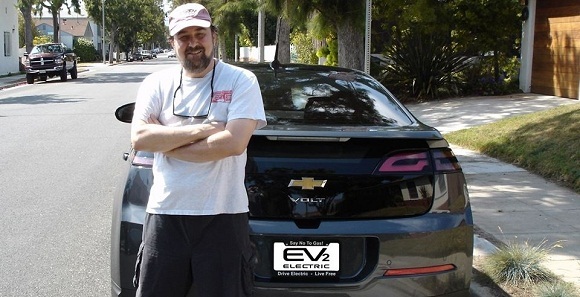 So here are some useful tips from this Chevy Volt plugin car owner that I find helpful. First, don’t ask this question “cold”. Introduce your host to your car first. Most notice that you are driving a new car and ask how you like it. This is your opportunity to explain its many advantages, including its superior power usage. Second, show them the car. Have them sit in the driver’s seat and turn it on. Ask them if they want to take it for a spin. Finally, ask them if they would like to see how easy it is to charge. Let them plug it in. This is your opportunity to educate them on the ease as well as the affordability of powering an electric vehicle. The national average electricity cost is 11 cents per kWh. It takes about 12 kWh to fully charge my Volt. That’s $1.32. Compared to the rest of your household electricity expenses, it’s surprisingly cheap. I find that once someone understands the true cost of charging my Volt, they are happy to let me do so. On a trip to San Diego from my home in Santa Monica, CA, I stayed at a local hotel there. I asked the hotel manager if I could plug in my car and charge it. At first, he said “No.” Then he agreed but said I’d have to pay him $100! After some further discussion about my car, he came down to $10. After 2 days, he liked the idea of having my car plugged in at his hotel so much (as many guests were asking about it) that by the time I left, he waived the $10 and told me he now wanted to get a plugin car too. He also said he was now going to install more plugs in the hotel garage so more guests could plugin. He realized EV charging is a value added service, just like free Wi-Fi. So here’s my advice. Ask! Take every opportunity to educate more people about the advantages of driving on electricity. After I started plugging in my Volt at work, my boss made the observation that he doesn't mind my plugging in as I drink more in coffee than the cost of electricity to charge my car. In my experience, the electrification of the automobile is a no brainer as they are simply better cars all around. Take it from me. One test drive and you will be hooked. Oh, and my boss now drives a Tesla. Written by Jeff U'Ren EV driver and activist from Southern California. Great article. There was one week where I had to drive to a hotel for a conference for a week. I asked the hotel if they had an outlet for me. They didn't, but they found a heavy duty extension cord from which they could run out some electricity and they reserved the parking spot for me. It was obvious that the guy in charge wanted me to plug-in my Volt there. Sorry, but you canNOT "drive the Chevy Volt forever without using gas". EMM and FMM and cold temps. Great story and timely. I find the amount of animosity and hostility towards Volts from other electric car ("Pure electric") drivers shocking. Some on forums I follow have said basically that the Volt is a hybrid and that it should never charge in public since they need the power (and thus the charging spot) to avoid being stranded. The new BMW i3 and i8 cars with their on-board range extenders may help stop this nonsense. I also think it is very cool that the new Honda Accord Hybrid and Plug in hybrid adopted the basic idea of the Volt. Let the gas engine charge the batteries and run off the electric motor. The Volt is not for me, but it is pretty clear to me it is an EV. james. Note the palm trees behind this guy. Where he lives the Volt is an EV for almost all who own one. I will never ask anyone to allow me to plug in my Volt. I even got offered by a relative to plug in and I said no. Even if it means using a little gas. In a year and after 10,000 miles I used like $24 in gas. For the same reason why people are not intelligent enough to do the math and figure out that driving a Volt is almost free compared to their old gas car. They are not intelligent enough to know an outlet can only give 1.5 kw per hour at about 0.12 cents a kw hour. Even offering to pay for the electricity can be uncomfortable. Why bother for pennies. Just enjoy your car and plug in at home. I leased and have been driving a 2013 electric car for free (not counting insurance) for 6 months including all the fuel I want and the next 6 months will be essentially free as well. Never leased a new gas car that was free for any period of time. Here's how I did it. 2013 LEAF. 3 year lease. $2,200 down + first months payment of $300 = $2,500 out of pocket. State of California sent me a check within a few weeks for $2,500 for leasing the car which went back into my pocket making my downpayment and first month costing me zero. Drove my gas burning, oil dripping, falling apart 18-year-old Volvo to a recycling center where they crushed the car to make something else out of it. State of California gave me a check of $1,500 right at the recycling center that very same day. That amount equaled 5 months of payments bringing my out of pocket to zero for the first 6 months. I get ALL of my electricity from free public chargers provided by the city I live in (Santa Monica) as well as Beverly Hills, Pasadena, Nissan dealerships and several retail stores and banks in the greater L.A. area. Fuel costs for the 6 months I have had the car and driven over 3,000 miles = zero. So that was 6 full months of driving the car including downpayment, registration and license, 6 months of lease payments as well as all the fuel I wanted for nothing out of my pocket that didn't get returned to my pocket. That cost me zip, nada, nothing other than an increase in my insurance but ANY new car was going to increase my insurance. While I will have to start paying after the 6 months out of pocket for the $300 a month lease payments I'm still getting all my fuel for free and will continue to do so for some time. If I was still driving the clunker Volvo, I'd be averaging at least $300 a month in gas, oil and additional internal combustion engine costs, such as oil changes, smog checks, brakes, tune ups, etc, etc. and I would be driving an 18-year-oldcar with all of its problems that was not fun or luxurious like my new EV is. For the $300 I'd be spending anyway on gas and oil I'm instead driving a brand new thrilling car with no maintenance or smog check hassles AND in Santa Monica EVs park for free at all meters anywhere in the city. No more fumbling for quarters or getting tickets because the bank line was longer than expected or because I ran into an old school friend and started to catch up and swapping stories. When people tell me that EVs cost too much, I just have to laugh and then I give them my story. That is an awesome story. So for the past many years you drove a car that dripped oil.Which went in to the water table. Not cool. No John, if you re-read my post you will see that I didn't say that "for many years" I drove a car that was dripping oil which went into the water table. That was your assumption, which I'm happy to be able to tell you is not the case at all. At the very end it started dripping oil, which was "not cool" as you put it, which is one of the reasons I had it recycled instead of selling it to somebody else and allow it to continue to consume gas, drip oil and pollute the air, as all gas burning cars do to varying extent. I took the car in twice to have the issues addressed and they worked for a while but ultimately the leaks came back and there was no more that could be done other than measure that would have cost more that the overall worth of the car and I only would be temporarily prolonging the life of a gas burning and oil consuming car that had a tailpipe, which is not what I wanted to do. Also, as much as I could and when feasible I put used contaminated cardboard that wouldn't be recycled under the car to collect whatever drips there may have been while it was stationary. I don't know of many other people that would go to these steps in an attempt to mitigate the issue as much as possible. Ultimately we decided that the most I responsible course of action would be having the car's metal and other recyclable products in the car reused. I removed a gas burning, motor oil using car from the face of the planet and replaced it with a car with no tail pipe and uses no traditional motor oil. This is the real environmental take away here from my story and I'm pretty proud of what my wife and I did. Thanks for giving me the opportunity to give you more of the facts. I agree. Asking takes little effort, but as you point out asking "cold" isn't the best approach. Having changed jobs and doubled my commute my LEAF made the 60 mile return trip just fine in the spring and summer, but as fall progressed it became obvious the LEAF wouldn't amke it in the depths of a Tennessee winter. My first attempt at finding a plug was to ask the multi-tenant building manager if I could plug-in to an outlet I saw on the outside of the building. The initial response was negative "need to speak with legal" and several other parties, and finally they declared the outlet 'didn't work' anyway. The cold approach failed. I noticed outlets on an adjacent sandwich shop. So instead of asking cold, I started buying more lunches there, ordered catering orders for my business, made myself a good customer. Then I asked for permission and the answer was a very quick yes. The sandwich shop owner is wiling to charge me just the cost of electric. I'll be sure to add a tip when the first electric bill comes later this month. Charging at work allows me to continue saving $180 a month. Well said Kelly. Recycling the car was a stand up thing to do. I just bought a '13 Volt about a month ago. I have a 40 mile commute every day, and even with that commute, and a couple of longer trips, I've only put in about $30 in gas. The car's an absolute dream to drive! Another friend of mine was so impressed that she bought one, too. I get tired of the negative comments about the Volt. They're always from people who have never driven one, and have no clue what they're talking about!